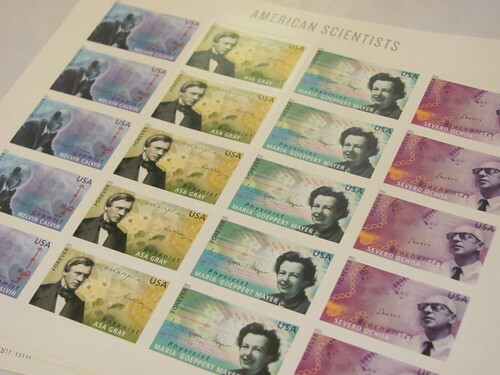 The United States Postal Service has released another stamp collection in their American Scientist series. Included here are chemist Melvin Calvin; botanist Asa Gray; physicist Maria Goeppert Mayer; and biochemist Severo Ochoa. I went to my nearest post office on Tuesday morning and purchased 3 sheets: one for myself, one to send to Richard Carter, FCD, and another to send to playwright Craig Baxter, who penned the fabulous Darwin/Gray drama, Re:Design. Has the USPS ever released a stamp in any way connected to evolution or Darwin? This entry was posted in C.R. Darwin, darwinalia, evolution, history of science by darwinsbulldog. Bookmark the permalink. No USPS Darwin stamps according to http://en.wikipedia.org/wiki/List_of_people_on_stamps_of_the_United_States. I received my set yesterday, thank you, Michael. I hadn’t realised that Asa Gray looked quite so dapper. I bought a sheet, too!